Get “Looking Back: True Stories of Mountain Maryland” for 99 cents! Amazon.com has temporarily dropped the price of Looking Back: True Stories of Mountain Maryland by 83 percent! You can now get the book for 99 cents. From the unsolved to the unusual. From the historical to the hysterical. From the famous to the friendly. This is life in the Maryland mountains. Did you know that a Russian prince once worked as a priest in Cumberland? Have you heard the story about the German POW camp near Flintstone during WWII? Do you know about the mining wars that were fought to try and unionize the coal mines in the Georges Creek region? Do you know the story behind Cumberland’s only lynching? Have you heard the story about the baseball game played between the Cumberland Colts and the New York Yankees? These are the stories of Allegany and Garrett counties in Maryland found in old newspapers, history books, journals, and other places. It’s the stories of people who tamed the mountains, established cities, raised families and lived their lives. Journey back in time and look beyond the photos that so well document the region’s history. This collection of 40 stories spans 220 years of life in Western Maryland. Originally published in the Cumberland Times-News and Allegany Magazine, some of these stories have been expanded as new information has been uncovered and new photos accompany some of the stories. Visit the Looking Back Amazon.com page. But why is that? The movie was well acted and the effects looked good. So I was trying to think about why it left me disappointed. Part of it was definitely because a lot needed to be cut from the book. The movie focuses on Louis Zamperini’s prison-camp experiences. It certainly is the most-exciting part of the book when Zamperini is facing life-or-death consequences. It only gives his running career and change from petty thief to Olympic champion a partial look and pretty much ignores his battle and recovery from post-traumatic stress. By giving those two sections of his life short shift, it ignored significant parts of what made Zamperini such an interesting person. His running childhood and running career showed readers how he developed such a strong belief in “If you can take it, you can make it.” The movie made his rise to fame as an Olympic runner look fairly simple. It wasn’t. Also, while the WWII experiences showed how Louis remained unbroken physically and mentally, the last part showed why he was unbroken spiritually. This was perhaps the most-important part of the story. Running came easy to him. He worked hard at it, but his life wasn’t on the line only his pride. His WWII experiences were a greater challenge to him and nearly broke him at times, but he hung on. However, I would say that his post-traumatic stress did break him. He became an alcoholic. That is not to say that he didn’t put his life back together. With help, he repaired himself and learned how to move forward. This might not have been exciting to see on the screen, but it was important for the man. Here’s the cover art for my new historical novel that coming out next month. Lock Ready is my first historical novel in seven years. It’s also been 10 years since I wrote my last Canawlers novel. Lock Ready once again return to the Civil War and the Fitzgerald Family. The war has split them up. Although George Fitzgerald has returned from the war, his sister Elizabeth Fitzgerald has chosen to remain in Washington to volunteer as a nurse. The ex-Confederate spy, David Windover, has given up on his dream of being with Alice Fitzgerald and is trying to move on with his life in Cumberland, Md. Alice and her sons continue to haul coal along the 184.5-mile-long C&O Canal. It is dangerous work, though, during war time because the canal runs along the Potomac River and between the North and South. Having had to endured death and loss already, Alice wonders whether remaining on the canal is worth the cost. She wants her family reunited and safe, but she can’t reconcile her feelings between David and her dead husband. Her adopted son, Tony, has his own questions that he is trying to answer. He wants to know who he is and if his birth mother ever loved him. As he tries to find out more about his birth mother and father, he stumbles onto a plan by Confederate sympathizers to sabotage the canal and burn dozens of canal boats. He enlists David’s help to try and disrupt the plot before it endangers his new family, but first they will have find out who is behind the plot. I’ve had fun writing about the Fitzgeralds over the years, but at this point, I see this as my last Canawlers novel. 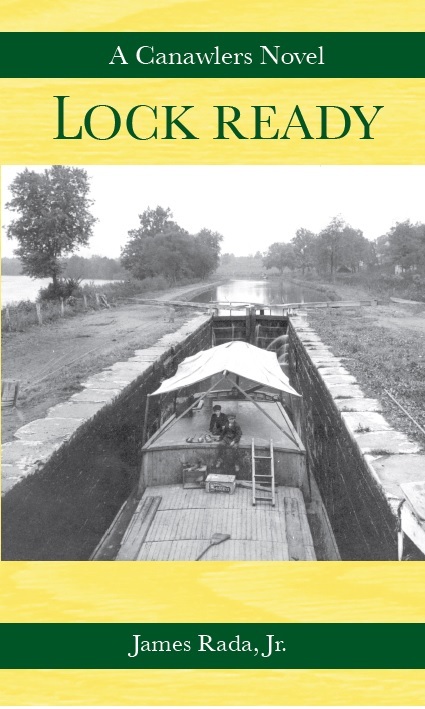 I do have an idea for a non-fiction C&O Canal book, but it will still be years before it comes out. Until then, I hope you enjoy my three Canawlers novels and one novella. The best order to read them in is: Canawlers, Between Rail and River, Lock Ready and The Race.